It’s no secret, men and women are wired differently. 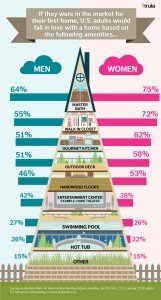 But recent research shows that when it comes to features that motivate them to buy, the connection between the sexes is not a battle. We found this to be true when working with client’s to find Winfield real estate. 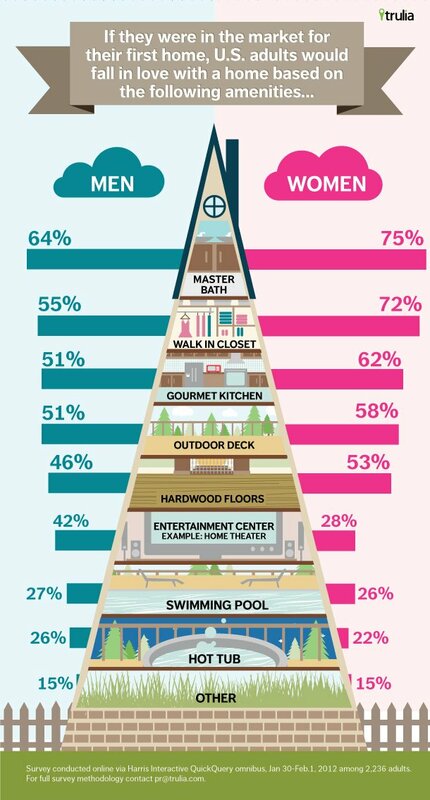 While there’s a small difference in what they love the most, our recent survey showed both men and women agree on which top features make them fall in love with a home. Content provided by Jovan Hackley, Manager at Trulia.com and does not necessary reflect the views of Luxury Valley Homes team. Jeff Daley is a REALTOR® and owner/agent of Luxury Valley Homes real estate. He is a member of the International Institute for Luxury Home Marketing and has taken specialized training in the selling and marketing of upper-tier homes. He holds an a PhD and MBA from George Washington University and rose through the ranks to senior management within Lucent Technologies with responsibilities for marketing and operations before taking early retirement in 1999 and starting his second career in real estate. Jeff has won numerous awards in real estate, is a Certified Luxury Homes Marketing Specialist, a member of the Millionaire Guild, has certified as a Graduate REALTOR® Institute, Distressed Property Expert® and e-PRO. Daley is published in national publications, is an instructor for real estate and is a distinguished combat Veteran and a member of the Veteran of Foreign Wars. He and his partner/wife Jane have their business in Scottsdale, Arizona where they serve the entire Valley of the Sun area and specialize in International and Scottsdale real estate. Jeff is also available as a media resource for interviews or articles. For more information, contact Jeff Daley at Luxury Valley Homes in Scottsdale, Arizona at 480-595-6412 or email.